Deoria tal, also spelled as Devoria tal, Devaria tal or Deoriya tal, is one of the most preferred trekking destination in Uttarakhand. Deoriya tal is a most popular lake. It is placed about 3 km on an uphill trek from the villages of Mastura and Sari, on the Ukhimath-Chopta road in Uttarakhand. 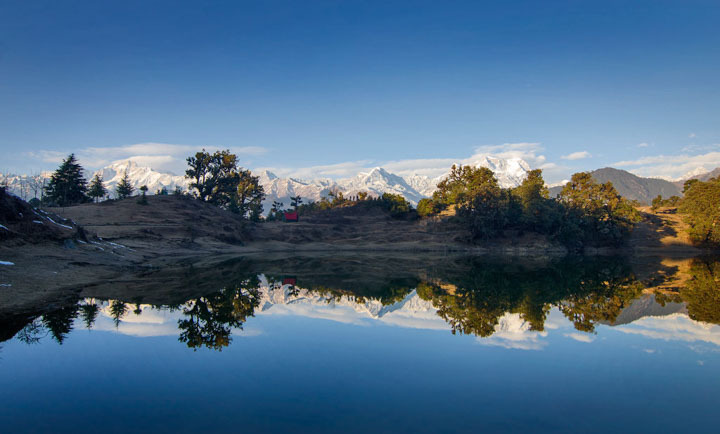 Deoria is Situated 2,438 meters above sea level in Rudraprayag district and it is a clam and serene lake popular for its mesmerizing reflections of Chaukhamba Range in the crystal clear water. 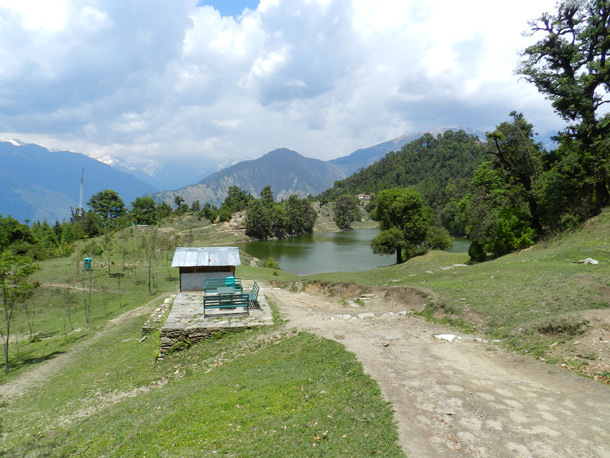 Deoria tal, is believed to be the lake where devatas (gods) bathed in ancient times. In the night, the density of stars on offer in the sky is such large that it makes you forget everything else. 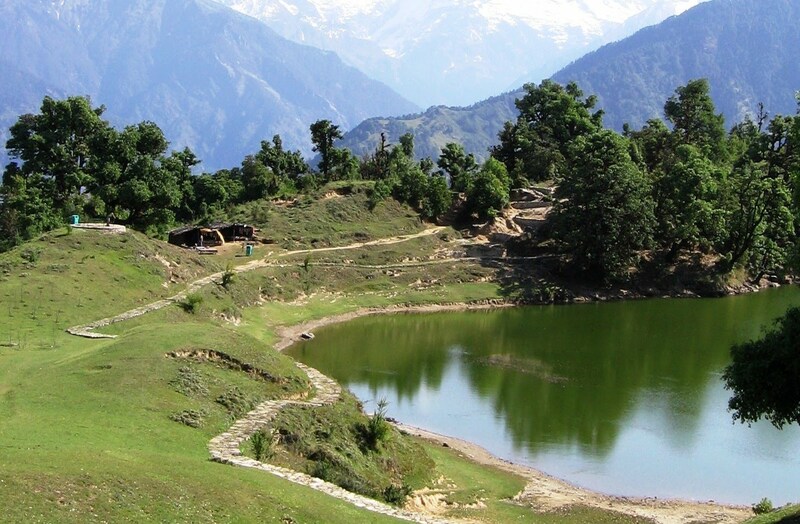 Deoria Tal is placed at a trekking distance of about 2 KMs from Sari Village and belongs to Rudraprayag district of Uttarakhand. Sari Village is located about 13 Kms ahead of Ukhimath. At Deoria tal there is two most best experience the first one is that you see real world and second is the reflections of beautiful surroundings on the lake. Deoriya tal is a beauty of the nature. if you really want to enjoy or to feel the charm of nature devariya tal would be a best option for you.You should visit the Devoriya tal because you mesmerizing so much information about nature and adventure of trekking . The trekking route to Deoria tal provides attractive view of snow capped Himalayan peaks, with beautiful green forest. Opportunities to experience chital and deer is high. Staggering perspective of Himalayas like Chaukhamba, Neelkantha, Banderpunch, Yellow tooth, Kedar go, Kalanag satisfy the trekkers making them overlook all the torment and straess. Overnight stay lets the trekkers make most out of the trek by offering enchanting view of deer. Night camping and jungle trekking is more adventurous. Devoria Tal is known as lake from where Lakshya asked Pandavs the questions on life. According to Mahabharat Once when Pandavs were in the Banbasa his fillings is Thirsty and tiered Yudhisthra tell Bhima to look for a place were they could bring water from. Sahadev went and tried to drink the water. At the time Yakshya stopped Sahadeva and asked him to answer his questions which Sahadeva denied and thus died the very moment he tried to gulp water. Same thing happened to Nakula, Arjuna and Bhima respectively. Finally when Yudhisthira came, he answered all questions of Yakshya before drinking the water. Happy with Yudhisthira, Yakshya asked Yudhisthira to choose one of his brothers to be alive and Yudhisthira choose Nakula. To Yakshyas bewilderment, Yudhisthira replied that though Bhima is the most strong and Arjuna the top in arrow shoot, he would choose Nakula to do just towards their second (step) mother Madri. Happy with the answer, Yakshya gives life to all four Pandavas who were lying on the bank of the lake dead. Yakshya is the father of Yudhisthira.Deoria lake maintains its purity and amazing beauty till date. Chandrashila : Chandrashila summit is a standout amongst the most loved goals of trekking fans in India. Trekkers outside of India too come to Chandrashila for trekking extraordinarily amid the late spring months. Just 1.5Km from Tungnath. Chandrashila is the slope lodging Tungnath sanctuary. Chandrashila crest, 4000 meters above ocean level, offers extensive variety of touring chance to the trekkers. Tungnath Temple: Tungnath sanctuary, one among the five of Panch Kedar journeys and the most astounding elevation sanctuary devoted to Lord Shiva, is arranged on the lap of Chandrashila crest in Chamoli area of Dev Bhoomi Uttarakhand 3,680 meters over the ocean level. Bearing the religious centrality, Tungnath sanctuary is a standout amongst the most went by journeys of India. Arm of master Shiva is loved in Tungnath sanctuary. Legend of Panch Kedar states about its beginning. Chopta : Chopta is a little district of knolls and evergreen timberland territory which is a piece of kedarnath natural life asylum situated in Uttarakhand state, India and a base for trekking to Tungnath, third sanctuary of Panch Kedar, which lies 3.5 kilometers (2.2 mi) away. Situated at a separation of 1.5 kilometers (0.93 mi) from Tungnath is Chandrashila, an ascending to more than 4,000 meters (13,000 ft). Summer : The summer time in Deorital is hot and pleasing. There is best Months March to mid-June are the best time to visit Deoria Tal. In this time you should Pack warm clothes for nights. Monsoon : At Devoria Tal during monsoon season there are landslide and road blockage can distrub the tourist. We are recommended to droup the monsson season. Winter : It is recommended that you bypass winter months November to February for Deoria Tal trek because the extreme cold and snowfall block your way. Deoria or Devoria Tal is a best place to visit if you go Devoria tal you feel seren beauty and mesmerizing more things. All Visitor uasually go to Devoria tal March till mid june. In that months night are cold all round the year.Monsoon season should be drop beacause untimely landslide on the rout and blockage of road. 1 : One of the first things you can enjoy walking on mountain peaks, with lush green woods and mesmerize seren beauty of Deoria Tal. 2 : In Devria Tal there is the night camping and star night photography is must to do things. October to Jun is the best time for night photography as well as weather is clear in night during these month. 3 : If you plane your trip for 2-3 days more to mesmerize the seren beauty and adventure of valley then Devariya Tal to Tungnath/Chandrashila trek via Rohini Bugyal / Bhrujgali is another breathtaking things to do from Devariya lake. Deoria Tal Trek | How to reach? By air : The nearest airport is Jolly Grant Dehradun.Haridwar is 34.1Km from Jollygrant airport. By rail : Haridwar railway station is nearest railway station. Haridwar railway is connect more station. Deoria Tal is 212.8 km from Haridwar. By road : Haridwar is open through roadways from all parts of the nation and normal transport benefit.